Carnival Companion mask is a from Gypsy Renaissance's Glamour & Glitz collection. 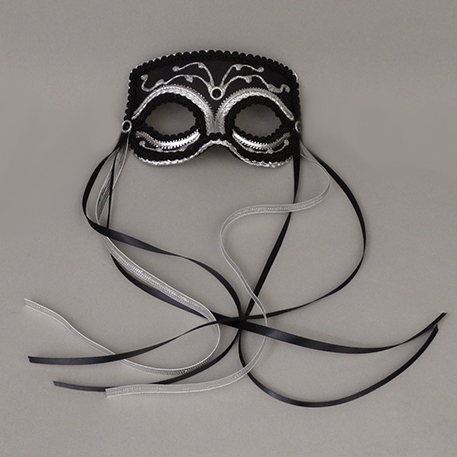 Carnival Companion is a mask with metallic trim, ribbons, and rhinestones. Carnival Companion mask is covered with hand painted lamé or moiré fabric and decorated with braiding and metallic trim. Mask is finished with satin ribbon streamers and rhinestones. Available in Black/Gold (as shown), Black/Silver, Red/Gold, Red/Black/Gold, Purple/Gold, Teal/Black/Gold, and Gold/Gold.